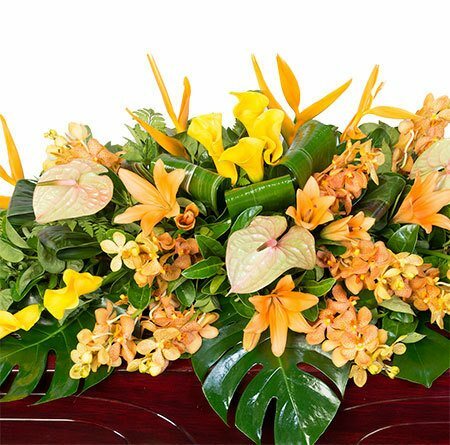 A lush, tropical flower arrangement for a funeral casket in citrus tones of orange and yellow. Featuring a combination of seasonal tropical blooms, this funeral casket spray includes flowers such as orchids, birds of paradise, and a mixture of Asiatic, anthurium and calla lilies (or similar). Offset with beautiful green foliage, this casket arrangement is available via our online florist shop or by phoning 1800 66 66 46 or emailing the team at sales@flowersforeveryone.com.au. 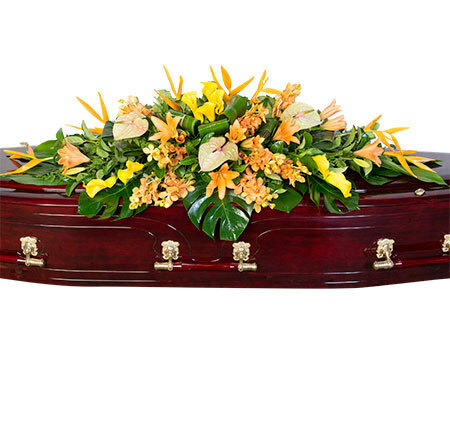 Do you need to arrange funeral flowers outside Sydney? Not a problem. Our florists will coordinate your casket flowers with an affiliate florist to recreate our design and colours as closely as possible.